At a news conference at the National Press Club, the six former officers and one ex-enlisted man recalled either personal sightings or reports from subordinates and others of UFOs hovering over nuclear missile silos or nuclear weapons storage areas in the 1960s, '70s and '80s. Three of the former Air Force officers – though they hadn’t seen the UFOs themselves - told reporters that UFOs hovering over silos around Montana’s Malmstrom Air Force Base in 1967 appeared to have temporarily deactivated some of the nuclear missiles. “I believe - these gentlemen believe - that this planet is being visited by beings from another world, who for whatever reason have taken an interest in the nuclear arms race which began at the end of World War II,” said Hastings, who added that more than 120 former military personnel have told him about UFOs visiting nuclear sites. More than 100 people protesting mountain-top removal coal mining were arrested Monday outside the White House for failing to obey an order to disperse, the U.S. Park Service said. The protest capped a three-day event called "Appalachia Rising" in the nation's capital. Residents of states in the coal mining region - West Virginia, Virginia, Kentucky and Tennessee - first came together for a weekend conference called "Voices from the Mountains." A federal judge declared a mistrial Monday in the case of two U.S. security contractors accused of killing two Afghanistan civilians. The jury in the case against Christopher Drotleff and Justin Cannon told Judge Robert Doumar that they were unable to reach a unanimous verdict. A retrial has been scheduled for March 1, 2011. North Korean leader Kim Jong Il's youngest son apparently was among more than 30 military promotions announced Monday by his father during celebrations of the Workers' Party of Korea's 65th anniversary, North Korea's state news agency reported. Kim Jong Un has been widely rumored to be his ailing father's anointed successor. A supply shortage of the drug used for executions in California will force a short term suspension of lethal injections in the state after September 30, according to spokeswoman Christine Gasparac with California Attorney General Jerry Brown's office. The California Department of Corrections and Rehabilitation (CDCR) informed the California Attorney General's office that it has been unable to secure sodium thiopental after September 30, according to Gasparac. In turn, Attorney General Brown's office will recommend that future executions wait to be scheduled until the CDCR expects to have the drug available. Los Angeles, California, has broken the all-time record high temperature of 112F with a temperature of 113F at 12:15pm PDT. Their temperature could rise more through the afternoon. Hall of Fame kicker George Blanda has died, according to the Oakland Raiders. President Barack Obama signed into law a $42 billion bill to aid small businesses Monday, saying it would create jobs by providing tax credits and helping banks increase loans. "It's going to cut taxes. It's going to make more loans available for small businesses. It's a great victory for America's entrepreneurs," Obama said to applause at the White House signing ceremony. While the bill's major provisions had backing from both parties, it took months of legislative wrangling to work it out. 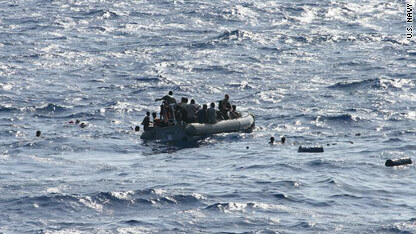 A U.S. Navy boat works to rescue passengers from a capsized skiff in the Gulf of Aden. Thirteen people drowned and eight are missing after a small skiff packed with more than seven dozen people capsized while getting aid from a U.S. Navy vessel in the Gulf of Aden, the U.S. military said Monday. The skiff, packed with 75 Ethiopians and 10 Somalis, was spotted adrift in the gulf by a South Korean warship, which asked the guided missile destroyer USS Winston S. Churchill to provide assistance, according to a statement from the Combined Maritime Forces, which conducts anti-piracy patrols off the east coast of Africa. The 9,500-ton, 513-foot long Churchill sent an inflatable boat to the aid of the skiff. After determining the skiff was without power, the inflatable towed it out of shipping lanes toward the Somali coast, the statement said. At about 8:30 am local time Monday, U.S. sailors attempted to distribute fresh supplies to those aboard the skiff. As they did so, the Africans rushed to one side of the vessel, capsizing it, and sending all 85 passengers into the ocean. Crews from the Churchill and an Australian patrol aircraft were able to rescue 61 of the skiff’s passengers. Thirteen drowned and eight were not found, the statement said. The Navy was investigating the incident. New construction began at settlement sites in the West Bank Monday, just hours after the expiration of a 10-month Israeli government moratorium on building. CNN witnessed new settlement construction in two locations in the West Bank. Bulldozers and other construction equipment were used at the settlements of Revava and Ariel, and a steady flow of construction equipment and vehicles were transported on tractor trailers on West Bank highways connecting various settlements. The new building casts a shadow over the continuation of face-to-face peace talks between Israelis and Palestinians that began this month. 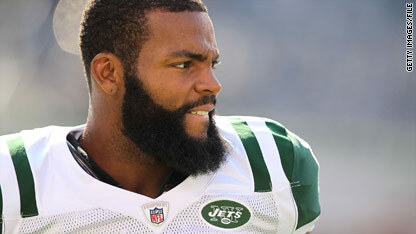 Braylon Edwards went into Sunday night’s game against the Miami Dolphins on the bench. Due to a self-imposed team suspension for his DUI arrest, Edwards was forced to sit on the sidelines for the first quarter of the game. While his actions off the field caused many to question his future with the organization, his ability on the field was hardly in doubt when he managed a 67-yard touchdown in the third quarter with just 4:30 seconds left on the clock. Edwards’ efforts helped the Jets to a 31-23 win against Miami, pushing the Gang Green into a three-way tie atop the AFC East. But it wasn’t just Edwards and the Jets that managed to impress this weekend. SI.com’s Don Banks recounts a weekend that also saw the Cowboys and Vikings break through with their first wins of the season. Particularly for Cowboys’ coach Wade Phillips, the win may have come just in the nick of time to save face for the team - and secure his job - at least for the time being. Tonight Green Bay and Chicago fans can look forward to a heated match-up, while the Phillies hope to win the NL East title. The former covert CIA agent and her husband, Ambassador Joseph Wilson, lost their place in Washington's Republican circles after late columnist Robert Novak outed her as a covert CIA operative. A New York Times profile shows how the two have rebuilt their lives in Santa Fe, New Mexico. She works as a consultant against nuclear proliferation; he runs the Africa division of a global construction company. Their 10-year-old twins go to public school. A biopic called "Fair Game" about the Wilsons' Bush administration travails, starring Sean Penn and Naomi Watts, opens next month. 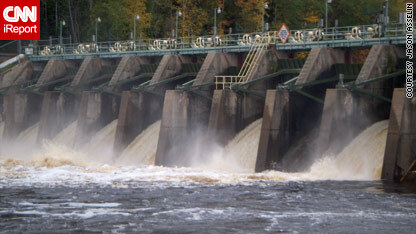 A dam in Niagara, Wisconsin on the Menominee River's flood gates are opened. As many as 100 homes could be affected by flood waters in Wisconsin due to the failure of a 120-year-old sand levee along the Wisconsin River. The levee, near the city of Portage in Columbia County, began to give way Sunday night, according to the National Weather Service's Milwaukee/Sullivan office. Patrick Beghin, a representative of the Columbia County Emergency Operations Center, confirmed to CNN Monday Morning that the levee had in fact failed. The owner of the Segway company has died, apparently in an accident involving one of his upright two-wheeled vehicles, police in England said Monday. Pakistan strongly protested Monday against NATO helicopter incursions into its territory from Afghanistan, calling them "a clear violation and breach" of the United Nations rules for foreign forces in Afghanistan. NATO helicopters have chased insurgents into Pakistan at least twice in the past few days, the International Security Assistance Force acknowledged Monday. That is not allowed, Pakistan's Foreign Ministry said in a strongly worded statement. The United Nations "mandate terminates/finishes at the Afghanistan border. There are no agreed hot pursuit rules," the ministry said. Wisconsin levee failing - As many as 100 homes could be affected by floodwaters in Wisconsin as forecasters anticipate the total failure of a 120-year-old sand levee along the Wisconsin River. The levee, near the city of Portage in Columbia County, began failing Sunday night, according to the National Weather Service's Milwaukee/Sullivan office. "Once the levee completely fails ... it is unknown how far south the flood waters of the Wisconsin River will travel," the National Weather Service says. Lawyer to the stars - It seemed Lindsay Lohan and her lawyer, Shawn Chapman Holley, were everywhere this summer. The scrape was minor, the coverage major. Lohan spent 13 days in jail for violating probation in a case involving a 2007 DUI arrest, and then got into more trouble for allegedly failing a drug test. And Holley, a former public defender who also worked on O. J. Simpson’s so-called defense Dream Team, was suddenly the “it girl” on the Los Angeles legal scene. CNN.com Justice producer Ann O’Neill profiles Holley, a quipping quote-master (“There’s the OJs and the NoJs," she says of the types of clients she has had) who wears $695 red-soled Christian Louboutin pumps and talks about Living La Vida Lohan. Southwest Airlines plans to acquire AirTran Holdings for $1.4 billion, the airlines said on Monday. Southwest chief executive officer Gary Kelly said the deal will allow his airline to expand into airports serving major hubs like Atlanta, Washington D.C., Boston, Baltimore and New York City. The deal has been approved by the board of directors of each airline, and is now contingent upon the approval of regulators and AirTran stockholders. Passengers on Delta flight 4951 experienced a scare when the plane, bound for John F. Kennedy International Airport was forced to make a without its right wheel. The landing gear had failed. The pilot said flight attendants told 64 passengers to “prepare for the worst," but the plane landed - sparks flying - on the runway and no one was hurt. Passengers erupted in applause. Kiran Chetry with "American Morning" talked exclusively with passengers Chase Benzenberg and Alessandro Albero who shot video of the emergency landing. Alessandro Albero: The first indication [of equipment malfunction] was while we were circling Westchester airport. We circled for a good 20 minutes. We were joking around with each other saying I don't know if he knows where the landing strip is. And then they made the announcement on the loud speaker. Kiran Chetry: What did they say? Chase Benzenberg: They said we're going to be making an emergency landing. They didn't really have many details except there was no landing gear. So we're envisioning belly slide the whole way with sparks, but they came out later and said it was only the right rear landing gear that came down so it'd be hitting the wing. Chetry: And what did it feel like to land? Albero: Landing was actually quite smooth. The pilot did a wonderful job. We came down and, you know, the plane tipped slightly and the sparks came out. You guys saw the video. It was pretty intense. But they did a wonderful job. Chetry: You know, it was funny - if there can be anything funny in this heart-stopping situation - you clearly heard the flight attendant. You could hear the stress in her voice, stay down, heads down. Clearly you guys weren't listening. Benzenberg: Well, we tried to follow directions. But she actually made it more intense than I think it was. But that's what the right thing to do in that situation is though so you don't bang your head. We didn't know what to expect, if we were going to flip or anything. So [we're] following directions at that point while filming, as well. Filed under: Air travel • TV-American Morning • U.S.
9:00 am ET - U.N. General Assembly - World leaders gather to discuss the issues of the day at the United Nations General Assembly in New York. 9:30 am ET - NYSE opening bell - The Croatian prime minister rings the opening bell on Wall Street. A suspected US drone strike killed two people in Pakistan's tribal region Monday, intelligence officials said. Two missiles hit a suspected militant hideout in Khush Hali, a village in North Waziristan, one of seven districts in Pakistan's volatile tribal region bordering Afghanistan, two intelligence officials said. The intelligence officials asked not to be named because they were not authorized to speak to the media. This is the third suspected US drone strike in as many days in Pakistan's tribal region and - based on a CNN count - the 65th this year.